HA note: The following series will run each weekday this week. It is reprinted with permission from Libby Anne’s blog Love Joy Feminism. Part two of the series was originally published on Patheos on April 17, 2013. This is the second post in a series looking at the relationship between HSLDA and both child abuse and educational neglect. In the introduction, I discussed my background with HSLDA and HSLDA’s move from focusing on the legality of homeschooling to protecting families from child abuse investigations. 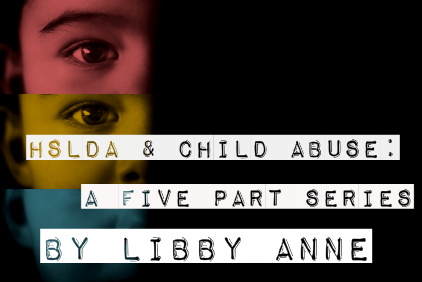 In this post I turn to HSLDA’s opposition to the reporting of child abuse. And I will warn you—this gets progressively worse as we go along. Anonymous Tips: As a condition of receiving federal funds, CAPTA should be amended to mandate states to require all reporters of child abuse to give their names, addresses and phone numbers. This will curtail false reporting and end harassment using anonymous tips. CAPTA should be amended by adding subsection 42 U.S.C. 5106a(b)(2)(A)(xiv): provisions and procedures to assure that no reports shall be investigated unless the person making such a report provides such person’s name, address and telephone number and that the information is independently verified. HSLDA justifies its involvement in issues like child abuse reporting by arguing that homeschoolers are frequently falsely reported to child abuse hotlines by neighbors and family, whether as a result of ignorance or malice. HSLDA sees this as a threat to its member families. On the surface level this sounds like it makes sense, but when you pause to think it sort of falls apart. If you fear false tips, the answer isn’t to make it harder for people to call in child abuse tips—which has the negative side effect of protecting abusers—it’s to make sure that CPS workers have good training and that there are sufficiently high evidentiary standards. In other words, you want the gates wide open at the beginning but narrower as the case progresses. Police receive anonymous tips all the time, and in fact rely on them heavily, especially when there are reports of threats or danger. Child abuse is a crime, and in arguing that anonymous child abuse tips should be barred HSLDA is asking for it to be treated different from any other crime. In the traditional structure of our jurisprudence, it’s easy to get a case filed, but as you move through the process it takes more and more evidence to keep the case from being summarily thrown out. It should take very little to get into the system, and it should take something substantial to have a verdict against you at the end of the process. And this is how our current system is set up when it comes to child abuse tips. But HSLDA wants to throw this out and treat child abuse differently from any other crime, in spite of the high stakes to the children involved. Doing away with anonymous tips to child abuse hotlines would mean more abused children going unreported, unnoticed, unseen. The entire point of the anonymous tip is so that anyone, without fear of reprisal, can report child abuse. This means that if you know that your nieces are being abused you can report them without your sister knowing that you turned her in. This means that if you suspect your crazy neighbor is abusing his children, you can report that without worrying that he might find out what you did, and seek revenge. This, quite simply, is why we let people make anonymous tips. If you take away the anonymous tip, people will be more likely to think twice before calling CPS with their suspicions of child abuse, and that means that more abused children will go unreported, unnoticed, and unaided. False Reporting: As a condition of receiving federal funds, CAPTA should be amended to mandate that states make it at least a class C misdemeanor to knowingly make a false report. U.S.C. 5106a(b)(2)(A)(iv) should be amended to add: . . .and penalties for any individuals who knowingly or maliciously makes a false report of any type of child abuse or neglect that includes—a provision stating that such persons shall also be liable to any injured party for compensatory and punitive damages and a provision requiring that all reporters be informed of the penalties for false reporting and that the call is being recorded. (e.g. Connecticut). While Klicka stipulates that the class C misdemeaner is applied to those whoknowingly make a false report, the effect of such a law is nonetheless the same as what I said above: It will make people leery of reporting child abuse. I mean, how would you go about proving that you really did suspect abuse against allegations that you just made it up? In practice anyone calling in a report that ends up being unsubstantiated would be liable for criminal prosecution. HSLDA has elsewhere stated that they want families who are turned in for child abuse to have the right to know who turned them in, and to have the ability to sue that person for false reporting. Are they unaware of the results such a policy would have? How can they not know that such laws and penalties would keep people from reporting suspected cases of child abuse, thus protecting abusers and keeping children in abusive situations? Klicka claims that his goal is to cut down on false reports—or, more specifically,malicious reports—and this is the line that HSLDA takes every time they argue against the existence of anonymous tips or for criminalizing false child abuse tips. But once again, false child abuse tips shouldn’t be seen as this huge problem. If a false tip is called in, a social worker will be dispatched to investigate the allegations and will find them unsubstantiated and close the case. If having a CPS worker at my door to check up on my kids because a neighbor was concerned—or even because a neighbor had a vendetta—is the price I have to pay for ensuring that a concerned neighbor also calls the CPS on an abusive family, then it’s a price I’m more than willing to pay. Cutting down on false reports, whether malicious or simply mistaken, also means cutting down on the number of reports that are not false. Getting rid of the anonymous tip and imposing criminal punishments for making false reports would make people think twice before taking the risk that reporting a family to a child abuse hotline would become, and thus would in practice have the effect of cutting down on the number of cases of child abuse, real and present child abuse, being reported and investigated. HSLDA also opposes extending mandatory reporting laws. People who are mandatory reporters are required by law to report suspicions of child abuse. In January of 2012 HSLDA opposed a federal law that would have made every adult a mandatory reporter. Here is the text of this bill, S. 1879. The requirement described in this paragraph is that the State has enacted a law that creates a felony offense with a minimum penalty of 1-year imprisonment for any person who, having reasonable cause to believe that a child has been subjected to child abuse or acts of child abuse, fails to report such information immediately to the relevant State law enforcement agency and the child protection agency of the State. S. 1879 will require every single person to be a mandatory reporter of suspected child abuse. States will lose certain federal funds if they do not create mandatory reporter laws that encompass every single person in the state. This will create a massive “police state” system that forces people to report on family members and neighbors even if they only suspect child abuse, or they will face a mandatory minimum sentence of one year in jail. HSLDA’s concern is that the bill would require people to turn in families if they “only suspect” child abuse. In other words, HSLDA plays off “having reasonable cause to believe” that there is child abuse occurring as mere “suspicions,” and at the same time minimizes suspicions of child abuse as things that probably shouldn’t be reported. Lay aside for a moment whether or not you think making all adults mandatory reporters on threat of criminal sanction is a good idea and simply pay attention to the reason HSLDA is against doing so—the idea that it’s unreasonable to expect those who “only suspect child abuse” (which is how it interprets the bill’s “having reasonable cause to believe” clause) to report it. Not only will S. 1877 require every single adult to be a mandatory reporter, S. 1877 will incentivize states to create untested, “experimental” programs that will increase the number of child abuse and neglect reports to CPS agencies. Once again, leave aside what you think of universal mandatory reporting laws and note that HSLDA is against the laws’ provisions aimed to “improve reporting” of child abuse and “increase the number of child abuse and neglect reports to CPS agencies.” In other words, HSLDA sees educational programs aimed at achieving more consistent, accurate, and voluminous reporting of child abuse and neglect asbad things. As someone who very much wants child abuse to be reported so that abused children can have access to the help they need, this is flabbergasting. Also in 2012, HSLDA opposed a California law that would have merely made employees of nonprofits that work with children mandatory reporters, requiring them to report suspected or known cases of child abuse, educational neglect, or sexual abuse. HSLDA opposed the law because it “would have caused the loss of tax-exempt status for nonprofit organizations with any activities involving children in California” for organizations whose employees did not report child abuse. This is perhaps only more confusing given that California’s instructions to mandatory reporters regarding what they are expected to report are not at all vague. HSLDA, then, is against both more consistent child abuse reporting and the reporting of child abuse suspicions when an individual has not personally witnessed the abuse taking place. HSLDA attorneys state that their concern is that programs aimed at improving child abuse reporting will make false reports skyrocket. And I’ll say it again, even if this were the case, so what? False reports will simply be found unsubstantiated upon investigation. It’s like they’re blind to the fact that child abuse is this real thing that really does happen and needs to be reported and stopped more systematically—and the fact that increased reporting of suspected child abuse is agood thing that will improve the lives of real children. HSLDA also appears to be unaware of the fact that eighteen states already have universal mandatory reporting and disaster has not struck—in fact, those states didn’t actually see explosions in false reporting, and in fact some evidence suggests that the child abuse reports in these states are more likely to be substantiated. (For more on mandatory reporting, this article is a good introduction.) Whatever your thoughts on universal mandatory reporting—and some scholars and advocates have their reservations—you have to at the very least admit that HSLDA’s arguments against universal mandatory reporting laws read like they come from a bizarre dystopia where reporting suspected child abuse is the problem and actual child abuse is not something worth worrying about. A competent adult who becomes aware of information or evidence that would cause a reasonable suspicion of child sexual abuse is required to report that information to state or local law enforcement or to county child protective services within 72 hours. SB 1551 – would have inappropriately required all adults, most of whom do not understand the complex legal definitions of sexual abuse in California law, to report any “reasonably suspected” child sexual abuse, even when based only upon a rumor. Penalties for failure to report all “suspected” child sexual abuse could have included imprisonment. We strongly agree with protecting children who are sexually abused but strongly disagreed with this bill’s proposed methods. Known child sexual abuse is a hideous and perverse crime that needs to be reported! We favor cracking down on known child sexual abusers. Current law already requires everyone who has observed child sexual abuse to report it and encourages everyone to report suspected child sexual abuse. The approach in SB 1551 is unnecessary and would have done great harm to the lives and freedoms of everyone. In other words, while “known child abuse is a hideous and perverse crime that needs to be reported,” requiring people to call in tips regarding child sexual abuse that is “reasonably suspected” is unreasonable. Leave aside the universal mandatory reporting requirement for a moment and you will see that the key word here is “known”—”observed” child sexual abuse should be reported, but child sexual abuse that is merely suspected? Not necessarily. HSLDA’s position appears to be that people shouldn’t necessarily feel that they need to call in child sexual abuse allegations based on silly things like “reasonable suspicion.” Is HSLDA not aware that child sexual abuse is something that is rarely caught in the act? Reading the above, I’ve realized that I’m completely flummoxed at how HSLDA has such a positive reputation among so many homeschoolers. I mean for goodness sake, the organization has concerns about people reporting the suspected sexual abuse of children! From opposing the anonymous tip to prosecuting those who call in false child abuse accusations to opposing mandatory reporting laws to suggesting that “suspicion” of child abuse is inadequate grounds for calling child protective services to arguing that child sexual abuse should only be reported if caught in the act, it appears that HSLDA is working to set up barriers to the reporting of child abuse. And as HSLDA itself states, that appearance is correct. HSLDA’s concern about false child abuse reports—something it really shouldn’t even consider a “homeschooling” issue—has led it to make efforts to restrict the reporting of child abuse. And making it more challenging to report suspicions of child abuse doesn’t just cut down on false reports—it cuts down on accurate reports as well. In HSLDA’s ideal world, only those who directly witness child abuse occurring (i.e., not just suspect that it’s occurring) and are willing to go on the record and be sued and charged with a crime if their allegations turn out to be unsubstantiated should call in child abuse tips. Think about that for a moment, and then ask yourself what that would mean, practically speaking, for the chances of children who are currently being abused, including the victims of sexual abuse. And when you’re done with that, feel free to join me in wondering, for the millionth time, how in the world HSLDA has become so prominent in Christian homeschooling circles. In the next installment we’ll turn to HSLDA’s stonewalling of child abuse investigations. Let me put it this way: It only gets worse.